When blogs first started, way back in the early roaring 00’s, they were pretty much all generalist blogs. “Here’s what I did today, here’s something I’m interested in, look at my kids, check out this link”. And lo, they were scoffed at – until it became clear that the cream very quickly rose to the top, and even the stereotypical pajama-clad stay-at-homes began pulling in traffic greater than traditional media websites. Most of the blogs were awful, sure, but soon there came two trends: the highly-trafficked generalist blogs, and the even-more highly-trafficked special interest blogs (often political) that have helped to define the form – your Huffington Posts, your Instapundits, your Daily Kos’s. In 2003 I got a gander to start writing about music, as I always had in the past, and thought the blog format might be a low-stakes and completely costless way to approach it, far easier than the fanzines I’d put out in the past that required so much time and diligence. I scanned the horizon, and it looked like in early 2003 there were only a half-dozen or so blogs devoted to underground rock music out there. While that changed very quickly – 2003 and 2004 were huge years for the growth of blogging – my AGONY SHORTHAND blog actually became fairly well-read by my low standards, considering that it had no photos or YouTube clips (in 2003 the ability to do those things either didn’t exist, or were impossible to add to your blog without coding experience). The blog was really just me reviewing records and CDs from my collection, or popping off about whatever musical sacred cow I wanted to flay that week. It actually peaked near its end in 2006, with an average of 650 unique readers per day - which is totally small potatoes for someone who actually, unlike me, really cares about this sort of thing, but it was flat-out amazing to me. Me being the petulant and easily bored type that I am, I quit doing Agony Shorthand as it was peaking at this level, and then self-referentially bathed in the very few “oh please don’t go” comments that followed my short retirement. There quickly followed an overlapping series of special-interest blogs that allowed me to explore my quote-unquote passions, and perhaps egotistically allowed me to try to convince others of my cultural & intellectual heft. Blogging is by nature egotistical and narcissistic, and since there’s no use denying it, I’ll at least say that I’ve tried to be as self-deprecating as possible in each of my endeavors. And no, I haven’t made a red cent off of any of them, save for the crap promo CDs I received for Agony Shorthand and Detailed Twang that I never solicited, almost never reviewed, and sold back for pennies to my local record stores. I knew that a niche blog would generate links from other blogs of that niche, and followers of that niche, if I kept it up long enough and maintained at least a “readable” level of quality, would perhaps come back often. 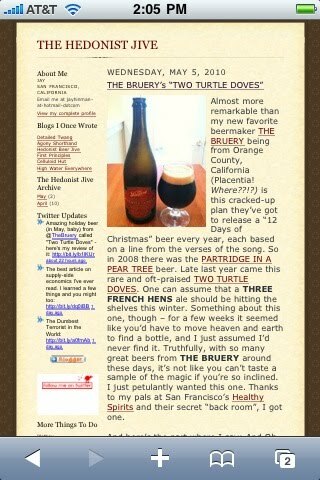 (As it turned out, this was only true of my 2 music blogs and the beer blog - no one read the other ones). Yet the rub with my blogs about film, politics, beer and 78rpm records is that they truly needed a fresh stream of content to keep readers interested, and for the most part, time simply did not allow me to do so. I did keep HEDONIST BEER JIVE updated every week, usually 3-5 times per week, but that’s only because I was drinking a copious amount of beer, and because beer is an exceptionally no-brainer topic to write about. The established journalistic bar is ridiculously low when writing about alcoholic beverages, so I could pop off a dumb review post in 5 minutes at work and be done with it. Not so with other things I’m interested in, and I’m pretty chameleon-like with my many interests. I might be frothing mad about government spending one week, deeply exploring new 45rpm garage punk singles the next, drinking a new brewery’s beers the next, and getting really heavy into some Swedish film director the next. I wanted a place where I could just slap it all together, and that’s why we’re now goin’ back to basics, baby. It's 2003 all over again. In 2010 it would appear that blogging, to say nothing of non-specific, generalist blogging like we’re tackling here at THE HEDONIST JIVE, is in decline. Micro-blogging on Twitter and Facebook is what’s hot now, and where web and smartphone readers seem to be spending more of their time. In a world of instant access to media everywhere, what’s most popular seems geared to shorter and shorter attention spans, for better or for worse. I sincerely doubt I’ll come even close to 650 daily readers ever again, and taking off the narcissism hat that drives so much of my online behavior, I’m going to declare that that’s just fine with me. I’ve got no pretentions whatsoever toward making a buck here nor anywhere with any writing that I do – I make a comfortable enough living at my regular job, and I think blogging is more self-preservation than anything else. In other words, my writing is to capture my thoughts and interests at a particular point in time, and it would be nice to have an archive of that for posterity. Before my own mind and memory disappear, too, I’d like to collect stories and events from my fairly pedestrian life in one central place, because I can. Historians have had to mine previous generations’ saved written correspondence to take the temperature of the times, but now technology allows for an intensely detailed record of an individual life, and that’s a pretty amazing step forward. Naturally I hope as many folks as possible think my fickle set of obsessions are worth looking at in real time, so please check back, ‘cause now that I’m unshackled from genre-based writing, pretty much anything’s fair game. Even the man won’t shut me up.